François-René, vicomte de Chateaubriand (4 September 1768 – 4 July 1848) was a French writer, politician and diplomat, considered the founder of Romanticism in French literature. Achilles exists only through Homer. Take away the art of writing from this world, and you will probably take away its glory. I am Bourbon as a matter of honour, royalist according to reason and conviction, and republican by taste and character. "De la restauration et de la monarchie élective" (1831). In living literature no person is a competent judge but of works written in his own language. I have expressed my opinion concerning a number of English writers; it is very possible that I may be mistaken, that my admiration and my censure may be equally misplaced, and that my conclusions may appear impertinent and ridiculous on the other side of the Channel. As quoted in Dictionary of Quotations from Ancient and Modern, English and Foreign Sources (1893) selected and compiled by James Wood. As quoted in A Dictionary of Thoughts: Being a Cyclopedia of Laconic Quotations from the Best Authors of the World, both Ancient and Modern (1908) by Tyron Edwards. Every institution goes through three stages — utility, privilege, and abuse. As quoted in Culture and Progress (1930) by Wilson Dallam Wallis. The original style is not the style which never borrows of any one, but that which no other person is capable of reproducing. J'ai pleuré et j'ai cru. I wept, and I believed. Bartlett's Familiar Quotations (1980) 15th edition. Though we have not employed the arguments usually advanced by the apologists of Christianity, we have arrived by a different chain of reasoning at the same conclusion: Christianity is perfect; men are imperfect. Now, a perfect consequence cannot spring from an imperfect principle. Christianity, therefore, is not the work of men. If Christianity is not the work of man, it can have come from none but God. If it came from God, men cannot have acquired a knowledge of it except by revelation. Therefore, Christianity is a revealed religion. I have made history, and been able to write it. … Within and alongside my age, perhaps without wishing or seeking to, I have exerted upon it a triple influence, religious, political and literary. I have explored the seas of the Old World and the New, and trodden the soil of the four quarters of the Earth. Having camped in the cabins of Iroquois, and beneath the tents of Arabs, in the wigwams of Hurons, in the remains of Athens, Jerusalem, Memphis, Carthage, Granada, among Greeks, Turks and Moors, among forests and ruins; after wearing the bearskin cloak of the savage, and the silk caftan of the Mameluke, after suffering poverty, hunger, thirst, and exile, I have sat, a minister and ambassador, covered with gold lace, gaudy with ribbons and decorations, at the table of kings, the feasts of princes and princesses, only to fall once more into indigence and know imprisonment. I have borne the musket of a soldier, the traveller’s cane, and the pilgrim’s staff: as a sailor my fate has been as inconstant as the wind: a kingfisher, I have made my nest among the waves. I have been party to peace and war: I have signed treaties, protocols, and along the way published numerous works. I have been made privy to party secrets, of court and state: I have viewed closely the rarest disasters, the greatest good fortune, the highest reputations. I have been present at sieges, congresses, conclaves, at the restoration and demolition of thrones. I have made history, and been able to write it. … Within and alongside my age, perhaps without wishing or seeking to, I have exerted upon it a triple influence, religious, political and literary. Memory is often the attribute of stupidity; it generally belongs to heavy spirits whom it makes even heavier by the baggage it loads them down with. In Berlin, (March 1821); Book IV, Chapter 1: Berlin – Potsdam – Frederick. Aristocracy has three successive ages, — the age of superiorities, the age of privileges, and the age of vanities; having passed out of the first, it degenerates in the second, and dies away in the third. Variants: Aristocracy has three successive ages. First superiorities, then privileges and finally vanities. Having passed from the first, it degenerates in the second and dies in the third. It was not his own destiny that inspired this new species of hero: it was that of his country; he did not allow himself to enjoy what did not belong to him; but from that profound humility what glory emerged! I halt at the beginning of my travels, in Pennsylvania, in order to compare Washington and Bonaparte. I would rather not have concerned myself with them until the point where I had met Napoleon; but if I came to the edge of my grave without having reached the year 1814 in my tale, no one would then know anything of what I would have written concerning these two representatives of Providence. I remember Castelnau: like me Ambassador to England, who wrote like me a narrative of his life in London. On the last page of Book VII, he says to his son: ‘I will deal with this event in Book VIII,’ and Book VIII of Castelnau’s Memoirs does not exist: that warns me to take advantage of being alive. Washington and Bonaparte emerged from the womb of democracy: both of them born to liberty, the former remained faithful to her, the latter betrayed her. I do not expect an imminent outbreak of war: nations and kings are equally weary … No doubt there will be painful moments: the face of the world cannot change without suffering. But, once again, there will be no separate revolutions; simply the great revolution approaching its end. Book VI: Ch. 8: Comparison of Washington and Bonaparte. Book IX: Ch. 4: Danton – Camille Desmoulins – Fabre d’Églantine. My downfall made a great noise: those who appeared most satisfied criticized the manner of it. Book XXVIII, Ch. 2: The Opposition follows me. How small man is on this little atom where he dies! But how great his intelligence! He knows when the face of the stars must be masked in darkness, when the comets will return after thousands of years, he who lasts only an instant! A microscopic insect lost in a fold of the heavenly robe, the orbs cannot hide from him a single one of their movements in the depth of space. What destinies will those stars, new to us, light? Is their revelation bound up with some new phase of humanity? You will know, race to be born; I know not, and I am departing. I behold the light of a dawn whose sunrise I shall never see. It only remains for me to sit down at the edge of my grave; then I shall descend boldly, crucifix in hand, into eternity. New storms will arise; one can believe in calamities to come which will surpass the afflictions we have been overwhelmed by in the past; already, men are thinking of bandaging their old wounds to return to the battlefield. However, I do not expect an imminent outbreak of war: nations and kings are equally weary; unforeseen catastrophe will not yet fall on France: what follows me will only be the effect of general transformation. No doubt there will be painful moments: the face of the world cannot change without suffering. But, once again, there will be no separate revolutions; simply the great revolution approaching its end. The scenes of tomorrow no longer concern me; they call for other artists: your turn, gentlemen! As I write these last words, my window, which looks west over the gardens of the Foreign Mission, is open: it is six in the morning; I can see the pale and swollen moon; it is sinking over the spire of the Invalides, scarcely touched by the first golden glow from the East; one might say that the old world was ending, and the new beginning. I behold the light of a dawn whose sunrise I shall never see. It only remains for me to sit down at the edge of my grave; then I shall descend boldly, crucifix in hand, into eternity. He has abundant views on the future, particularly on the subject of religion and the social rôle which he believed it called upon to play. His influence on literature is unanimously acknowledged. 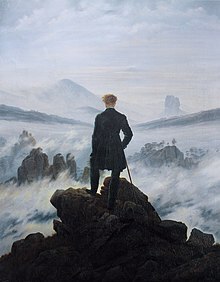 Romanticism may be traced back to him, and it may even be said that the whole literary movement characteristic of the nineteenth century begins with him. In the twenty-sixth book of his Mémoires d'outre-tombe, Chateaubriand recounts his 1821 arrival at the French embassy in Berlin. 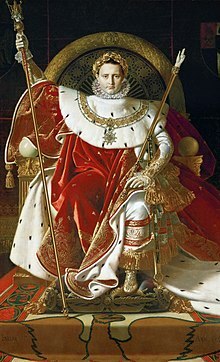 He cites a flattering portrait of him written by the Baroness of Hohenhausen and published in the morning press on March 22: "M. de Chateaubriand is of a somewhat short, yet slender, stature. His oval face has an expression of reverence and melancholy. He has black hair and black eyes that glow with the fire of his mind." At this point, Chateaubriand flatly adds: "Mais j'ai les cheveux blancs; j'ai plus d'un siècle, en outre, je suis mort" ("But I have white hair; I am more than a century old, besides, I am dead") … Of course, those startling words, "en outre, je suis mort" do not refer to the year 1821, nor to the time Chateaubriand is writing this account. Rather, they refer to the time we, readers, turn to this specific page of the Mémoires: as you are reading this, Chateaubriand reminds us, I am dead. The words wrest us away from the event he is relating, his arrival in Berlin, to remind us in the most direct terms that our reading of these words necessarily entails the death of their author. Moreover, the French en outre brings us back to the very title of the Mémoires d'outre-tombe: outre-tombe, from beyond the grave. In 1836, Chateaubriand signed a contract with a society of shareholders: in exchange for an immediate payment of 156,000 francs and a life annuity, he sold "the literary ownership of his Mémoires as they existed and as they would exist at his death." Commenting on this transaction, Maurice Levaillant notes: "With this agreement, Chateaubriand bought material security at the price of a concession that he never got over: instead of appearing after a period he had first prescribed as fifty years after his death, his Mémoires would suddenly appear, so to speak, live from his grave."